So far we have looked at Agatha Christie, the Orient Express rail line, and the culture/mood of the times. We have noted that Christie had personal ties to the rail line and was very familiar with the routes and locations it traversed. She was also a product of her times…working through two world wars, experiencing wealth and poverty, great personal tragedies and great fame. She survived her own mysterious disappearance in 1926. The Great Depression and the rise of dictatorships in Europe meant a lot of social and civil unrest with desperation at hand for many. Questions of loyalty, government, social morals, and right from wrong began to arise. Which brings us to the most intriguing part of the book, in my opinion. How to create a murder victim so heinous that Christie's unique plot would work. The murder victim is a much older, crankier man than Johnny's dapper gangster figure we've seen in the trailers. Monsieur Ratchett is described quite vividly in the book as "evil" and he is very paranoid of everyone and everything. Why? We later learn that Ratchett is responsible for kidnapping and killing the child of a wealthy American family. Who wouldn't want a man like that dead? The inspiration for this plot twist comes straight from the pages of history as the crime of the century…at least for 1930s. It was the Jazz Age, the Gilded Age, and the Roaring Twenties. Art deco was the norm and opulence was king. Enter Charles A. Lindbergh (1902-1974), a shy, handsome American aviator. He shot to fame and fortune within 48 hours after his solo trans-Atlantic flight from New York to France in 1927. The press named him Lucky Lindy and the Lone Eagle. 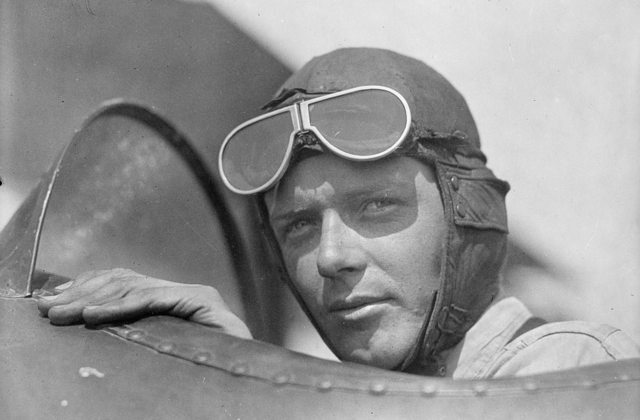 The son of a Congressman who enjoyed mechanics and flying, Lindbergh left school to work as a daredevil stunt pilot at state fairs. He enlisted in the US Army (there was no Air Force at the time) to train as an Army Air Service Reserve pilot. After his military service, he flew the mail route between St. Louis and Chicago. In 1919, a New York City hotel owner offered $25,000 to the first aviator to fly nonstop from New York to Paris. Many pilots had died trying to accomplish the feat. Lindbergh believed he could win if he had the right plane and convinced a St. Louis businessman to finance his plane and flight. On May 10-11, 1927, he tested his plane, The Spirit of St. Louis, by flying from San Diego (where the plane was built) to St. Louis to New York. That flight took 20 hours 21 minutes, a transcontinental record. He was now ready to fly the Atlantic and on May 20 took off from Roosevelt Field and landed 33 ½ hours later at Le Bourget Field, near Paris, on May 21. Like most celebrities, fame comes with a price as everyone tries to get a piece of that pie. Lindbergh tried to live a normal life with his wife and family, but that proved impossible. He was too famous during a time that craved celebrities and all the promotion they could muster for a cause. While Lindbergh accomplished many things in his life, some of which were controversial, he will always be remembered for two things: his famous flight and the kidnapping of his son. On March 1, 1932, the unthinkable happened. His 20-month-old son, Charles Jr., was abducted from the family home in New Jersey about 9 p.m. from the second floor nursery. He was discovered missing by his nurse and a search was immediately conducted. A $50,000 ransom note was found on the nursery window sill. The local police, state police, and eventually the federal government were brought in to investigate. In addition to the ransom note, muddy footprints and two sections of a wooden ladder were found. What wasn't found were fingerprints or any signs of blood stains/trauma. All household employees were questioned. 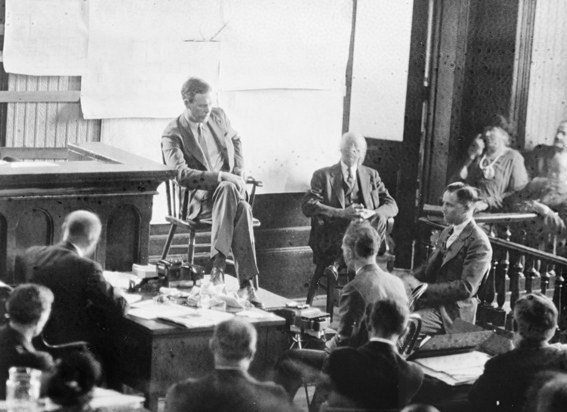 Public appeals were made and Lindbergh's friends handled negotiations with the kidnapper. Even underworld criminals were used in attempts to contact the kidnapper. 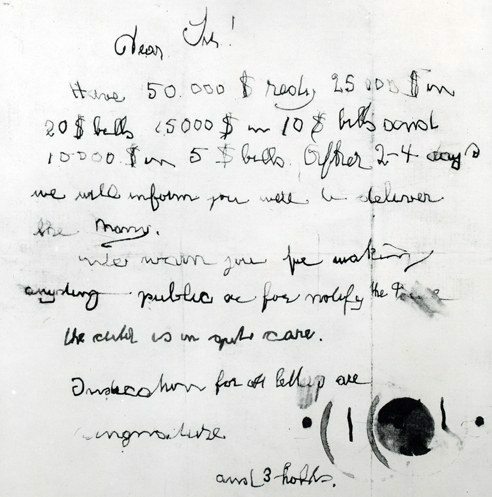 A second ransom note was delivered a few days later via the mail with the price increased to $70,000. Private investigators and the governor were brought in. This truly became a legal and media circus. By now, a third ransom note was received with more conditions attached. Then a fourth note, then a fifth note. The $70,000 was raised and negotiations began using newspaper columns with a code name of "Jafsie" to communicate with the kidnapper. A sixth note was found detailing payment conditions for the ransom. 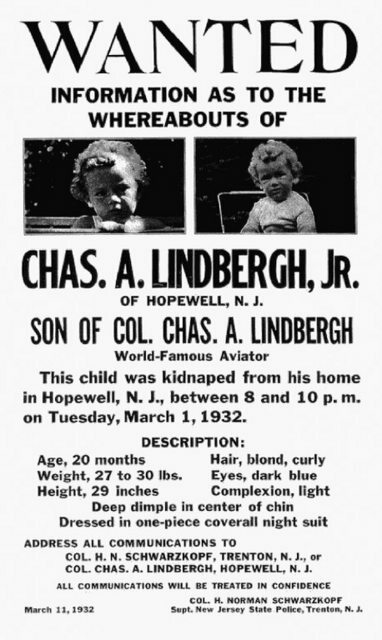 Lindbergh's agents demanded some proof of identity from the kidnappers and the baby's sleeping suit was received with a seventh note. An eighth note was received as negotiations continued. In all, 13 notes were received and $50,000 was given to an unknown person believed to be the kidnapper. The 13th note gave instructions where to find the baby after the money had been paid, but no baby was found at the location in the note. Instead, the body of young Charles was found on May 12 partly buried in a grave about 4 miles from the family home. Badly decomposed, the body was discovered by a passing trucker. His skull had been crushed. After a positive identification, young Charles was cremated. The autopsy revealed the child had been dead for about two months. The investigation for the kidnapper/murderer continued for years. One person of interest committed suicide shortly before she was to be re-questioned. It was later determined that she had no connection to the case. The use of the FBI and Department of Justice was unique at this time since the federal government had no jurisdiction in such matters. President Franklin Roosevelt enacted many proclamations during the investigation that eventually led to the Department of Justice taking over from J. Edgar Hoover, the FBI, the Internal Revenue Service Investigative Unit and all local and state authorities. The Treasury Department became involved as a majority of the ransom was paid with gold and gold certificates that could be identified. During the investigation, many attempts of fraud and extortion were recorded as people claimed to be the kidnappers or knew the kidnappers or might be witnesses of some kind. Some were mentally ill and believed they were the kidnappers. There was a huge exchange of misinformation, well-intended good-deed doers, and others who were trying to profit in some way from the publicity associated with the case. 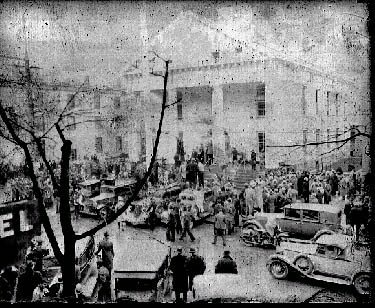 By 1933, some of the gold certificates began appearing at the Federal Reserve, but authorities couldn't track down the depositor. Eventually more certificates were passed and authorities were able to create a pattern of use and narrow the field of investigation. A break in the case came in Sept. 1934 when a gold certificate was traced to Bruno Richard Hauptmann. Authorities surrounded his house and apprehended Hauptmann as he entered his car. Hauptmann fit the description given by Dr. Condon who negotiated with the kidnapper directly on behalf of the Lindbergh family and was later identified by Condon in person. He was also identified by the gas station attendant who contacted authorities about a gold certificate he received as payment for gasoline and wrote down the license plate number that led authorities to Hauptmann. He was also identified by another Lindbergh associate as the person who delivered the fifth ransom note. Upon searching his premises, more ransom certificates were found in Hauptmann's garage. His handwriting was compared to the ransom notes and similarities emerged. Hauptmann was a native of Germany (it was believed the kidnapper was German) and had a criminal record for robbery and served time in prison. He tried to enter the US illegally at least twice and was deported both times. On the third try, he made it, married a waitress, and had a son. As an illegal resident, he had trouble getting a job and worked as a carpenter. Shortly after the kidnapping, however, he never really worked again, claiming that he made a living on the stock market. An odd claim considering this was during the Great Depression. His skills as a carpenter would also be used as evidence against him as the probable creator of the ladder used to reach the nursery. 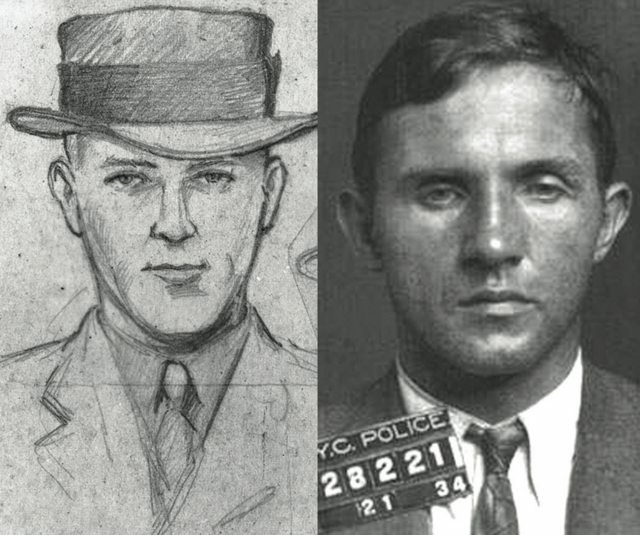 Hauptmann was indicted in 1934 for extortion and murder in New York and later extradited to New Jersey for trial. His trial began in Jan. 1935 and lasted 5 weeks. Evidence included: tool marks on the ladder matched his tools; wood in the ladder matched his attic flooring; Dr. Condon's telephone number was found scrawled on a door frame; and the matching handwriting. He was found guilty of murder on Feb. 13, 1935 and was sentenced to death. The defense appealed, but the Supreme Court of New Jersey upheld the verdict and the Supreme Court of the United States denied that appeal. His execution date was moved several times during legal maneuvers and he was executed on April 3, 1936. This was not the end, however, as conspiracy theories abound. Hauptmann always maintained his innocence, claiming the certificates were given to him by a business partner. He said he hid the money because of the strife he endured in Germany after WWI. 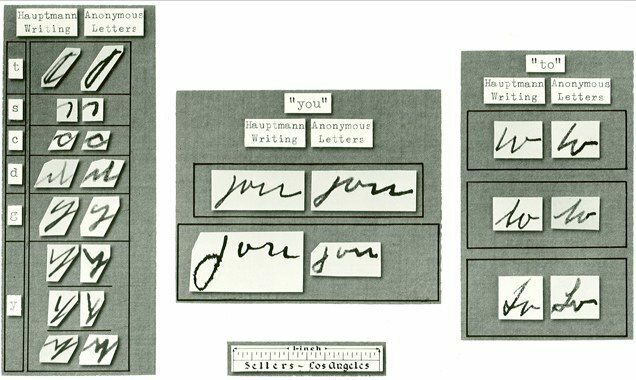 He also claimed abuse by the police and investigators and that he was forced to create handwriting samples that matched the ransom notes. In the book, Scapegoat: The Lonesome Death of Bruno Richard Hauptmann, Anthony Scaduto maintains that Hauptmann was framed and points to many holes in the investigation. This was the first of many books that attempt to prove the wrong person was executed for this crime. Others believe he was targeted because of his German roots, his illegal status, that others had to be involved, and a sloppy investigation that was taking too long to produce a murderer for killing the son of the greatest American hero of the time. Another theory, and this is the most disturbing, is that Lindbergh himself orchestrated the kidnapping since kidnapping of wealthy children was apparently common during the Depression. A Rutgers historian, Lloyd Gardner, has studied, researched, and written books about the case. He was featured in a NOVA television special about the kidnapping. He theorizes that Charles Lindbergh was fascinated by Social Darwinism and believed in the racial superiority of northern Europeans compared to southern Europeans and Asians. Young Charles had many health issues that were hidden from the public and investigators at the time, but proved that he wasn't "perfect." He had a rickets-like condition that affected the development of strong bones that required doses of Vitamin D and the use of sun lamp. He also had hammertoes, a large cranium and un-fused skull bones. 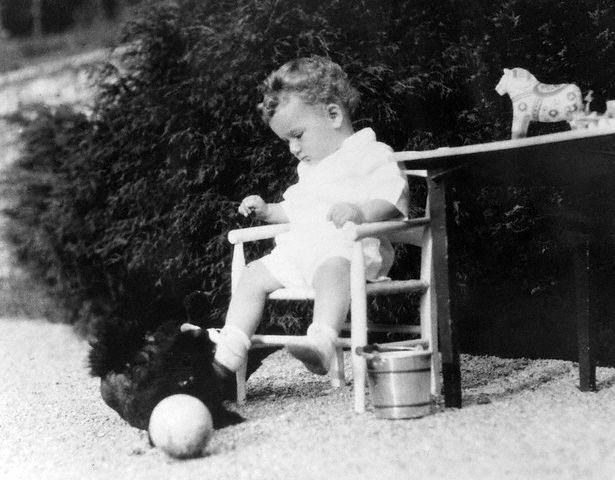 Gardner believes that Lindbergh wanted the child to appear kidnapped so that he could be institutionalized and that he never meant any harm to come to the baby. Gardner also notes that Lindbergh took charge of many aspects of the investigation, keeping some staff away from questioning by authorities. And it was Lindbergh who ordered the cremation of the body. Gardner points out that Lindbergh wasn't supposed to be home that night, either. He was supposed to be at a speaking engagement in New York and that Lindbergh never missed a speaking engagement. Did he go home to facilitate the kidnapping or was it just coincidence? But the case did lead to the creation of the Lindbergh Act of 1932 and Lindbergh Law that prohibits kidnapping and transportation of victims from one state to another, making it a felony. The act punishes a person with imprisonment for a term of years or for life. This also allows for the federal government to oversee the investigation if necessary. While child abductions still occur due to parental disputes or pedophiles, abductions for ransom are extremely rare. With respect to subsection (a)(1), above, the failure to release the victim within twenty-four hours after he shall have been unlawfully seized, confined, inveigled, decoyed, kidnapped, abducted, or carried away shall create a rebuttable presumption that such person has been transported in interstate or foreign commerce. Notwithstanding the preceding sentence, the fact that the presumption under this section has not yet taken effect does not preclude a Federal investigation of a possible violation of this section before the 24-hour period has ended. If two or more persons conspire to violate this section and one or more of such persons do any overt act to effect the object of the conspiracy, each shall be punished by imprisonment for any term of years or for life. Whoever attempts to violate subsection (a) shall be punished by imprisonment for not more than twenty years. If the victim of an offense under subsection (a) is an internationally protected person outside the United States, the United States may exercise jurisdiction over the offense if (1) the victim is a representative, officer, employee, or agent of the United States, (2) an offender is a national of the United States, or (3) an offender is afterwards found in the United States. As used in this subsection, the United States includes all areas under the jurisdiction of the United States including any of the places within the provisions of sections 5and 7 of this title and section 46501(2) of title 49. For purposes of this subsection, the term “national of the United States” has the meaning prescribed in section 101(a)(22) of the Immigration and Nationality Act (8 U.S.C. 1101(a)(22)). In the course of enforcement of subsection (a)(4) and any other sections prohibiting a conspiracy or attempt to violate subsection (a)(4), the Attorney General may request assistance from any Federal, State, or local agency, including the Army, Navy, and Air Force, any statute, rule, or regulation to the contrary notwithstanding. As used in this section, the term “parent” does not include a person whose parental rights with respect to the victim of an offense under this section have been terminated by a final court order. 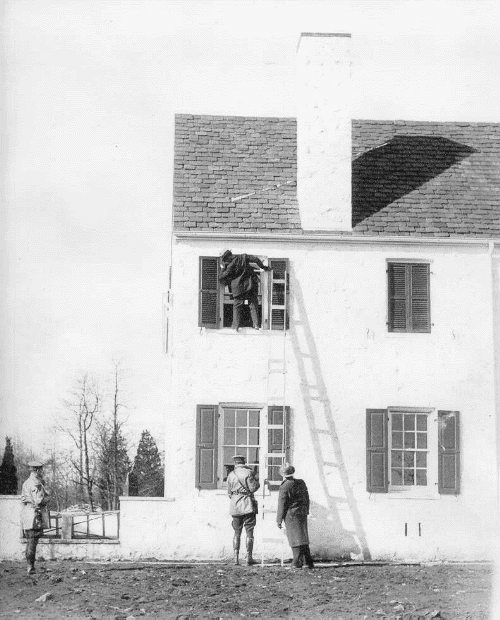 Rutgers Today: Was the Lindbergh Kidnapping an Inside Job? Very interesting Snoopy, had no idea her story was inspired by a real story and had not heard of this before. Gilbert's Girl wrote: Very interesting Snoopy, had no idea her story was inspired by a real story and had not heard of this before. Yes, it really must have been a grisly scene and investigation, but Christie was very keen on the times and what related to the current population...to take two real and recent incidents (the train in the snow and the kidnapping) and turn them into a murder mystery with a twist. Makes me want to learn more about how her other stories came about. Very interesting...I looked a little more because of the theory that Lindbergh himself was involved, and found an article by Jim Fisher, a former FBI agent and a professor at Edinboro University. He wrote a book on the case and the theories: The Ghosts of Hopewell: Setting the Record Straight in the Lindbergh Case. It certainly was a media circus at the time. It never makes sense when a kidnap victim is murdered. I never heard of this other theory, and it does make some sense. stroch wrote: Very interesting...I looked a little more because of the theory that Lindbergh himself was involved, and found an article by Jim Fisher, a former FBI agent and a professor at Edinboro University. He wrote a book on the case and the theories: The Ghosts of Hopewell: Setting the Record Straight in the Lindbergh Case. I saw that article in my research and forgot to include it among the references. Thanks for finding that again! fireflydances wrote: It never makes sense when a kidnap victim is murdered. I never heard of this other theory, and it does make some sense. Many experts believe the child died accidentally during the abduction...either fell or was dropped from the ladder. Some contend he may have been suffocated to keep him from crying/screaming. Also, in the documentary, they mention a hole found at the base of the skull on one side and the crushing impact on the other side. No one has been able to explain the hole...was it from a bullet? Why didn't anyone hear a gun? The police suggested at the time that the hole was made accidentally when trying to extricate the child from the grave, but a forensic pathologist wasn't buying that. That NOVA program is on Netflix. I watched it a while back, it was most disturbing to me. Lindbergh was always presented as tragic American hero and I had no idea about his bizarre fascination with genetics etc. and his life in later years. It seems odd to think Lindbergh might not be known in other parts of the world since he is a bit of a cultural icon here in the States. It is interesting the Christie found the story inspiring. nebraska wrote: That NOVA program is on Netflix. I watched it a while back, it was most disturbing to me. Lindbergh was always presented as tragic American hero and I had no idea about his bizarre fascination with genetics etc. and his life in later years. It seems odd to think Lindbergh might not be known in other parts of the world since he is a bit of a cultural icon here in the States. It is interesting the Christie found the story inspiring. When you consider the kidnapping took place in 1932 and the manhunt still in the news when the book was published in 1934, I would imagine it was very much on her mind. In my research of her, it seems she could pluck the simplest of plots out of thin air and twist them into an intriguing story within minutes. Just what made her pull a snow-stranded train, a child kidnapping, and a murder out of the news and into one storyline is baffling to me. Imagine what she could do with some of today's headlines! He may have been well known at the time in other parts of the world. Podcast being released the same time as the movie! Up and Vanished and Murder on the Orient Express present a podcast exclusive, "Everyone Is a Suspect." True crime often inspires the most successful fictional crime stories. When told by a visionary novelist like Dame Agatha Christie, dubbed "The Queen of Crime," these fictional stories can become larger than life and even more compelling than truth. "Everyone Is a Suspect" dives deeper into both fact and fiction, taking a closer look at the “Crime of the Century," the 1932 Lindbergh Baby kidnapping, which, along with Christie’s own experiences as a passenger on the Orient express, inspired her to write the 1934 novel Murder on the Orient Express. In true Up and Vanished fashion, host Payne Lindsey will reexamine the Lindbergh kidnapping case, and even retrace Christie’s steps by embarking on his own trip aboard the Orient Express. In preparation for the November 10th premiere of Murder on the Orient Express, the podcast will also include interview episodes titled, "The Suspects.” Each episode will focus on the upcoming film, featuring a collection of cast interviews, discussing the MOTOE novel and film, the parallels between true crime and fiction, podcasting, and more.